Belle is a costume drama that we don’t need to feel guilty about adoring. The genre, long cherished by us women yet noticeably full of appallingly backwards gendered and racial politics that have not necessarily been addressed in any thoughtful way, receives a fine vindication here as a genre capable of depth and magnitude. The film, based very loosely on historical events and directed by Ghanaian-British director Amma Asante, follows Dido Belle (Gugu Mbatha-Raw), a young mixed-race woman living precariously within 18th century aristocratic English society. She is the illegitimate product of a love affair between a prominent English Royal Navy officer (Matthew Goode) and a black woman in the West Indies, deposited in the home of her wealthy uncle, Lord Mansfield (Tom Wilkinson), a prominent judge who reluctantly takes her in. She grows up to be a much-loved, though formally excluded, member of his aristocratic household. When Dido’s father dies, he leaves her a fortune of £2000 a year: enough to make her a wealthy heiress, even as her coquettish blonde cousin Elizabeth (Sarah Gadon) is left penniless. At first Lord Mansfield tells his ward that she is not to marry; her skin colour means she cannot possibly be desired as a mate by anyone of “suitable” rank. 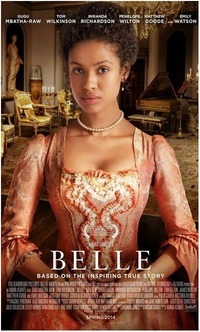 However, Belle is pursued despite her skin colour by the penniless second son (James Norton) of another wealthy family. Meanwhile, she meets a dashing young Heathcliff of a suitor (Sam Reid), far beneath her in rank, who sets her heart aflutter with his talk of abolitionism. The ensuing Austenian tale of love overcoming social barriers in this tightly regulated society takes on harrowing racial implications, expanding the reach of the genre well away from its usual pre-multiculturalism nostalgia. The film, and especially Gugu Mbatha-Raw in the title role, handles the torment of Dido’s circumstances with a grace that is often astonishingly heartfelt. Dido is accomplished, disarmingly articulate, and painfully self-aware of her cruel position, simultaneously valued and abhorred even by her own family. The love story is framed within a tumultuous Enlightenment-era political landscape, with the film giving near equal weight to a famous court case in which a slave ship’s captain tossed his entire human cargo overboard, apparently due to a water shortage. Remarkably, Dido’s uncle Lord Mansfield was the presiding judge in the case, and the film hinges on his decisions here as much as it does on the love story itself. The eminent judge thus functions as a kind of Shakespearean father figure, reimagined for the Enlightenment era: both young lovers and abolitionist agitators must change the old man’s mind in order to earn legitimacy for their respective causes. Packed with the pleasures, emotional and sartorial, of the costume drama, yet laying bare the cruel racist and sexist structures of 18th century English society, Belle is incontestably important. Without any of the horrific violence depicted in 12 Years a Slave (a point Dido makes herself when she acknowledges that she is in far better circumstances than so many others of her race), it nevertheless delivers a haunting emotional punch that will make you simultaneously weep for joy when Dido finally finds happiness, and cry tears of sadness at her atrocious mistreatment in a deeply racist, slaveholding society. This review was published on June 17, 2014.